What makes your iPhone so expensive? Guy 1 – Hey! I’m buying an iPhone. Guy 2 – Whoa! So whose kidney are you selling for it, bro? I am sure most of us have wanted an iPhone at some point in our life but after you look at the price, you just console yourself that they are not made for you. For those who say they don’t like iPhone and never wanted one, well the grapes are sour. And then there are those who play it smart and order it from abroad. Like I did. Because obviously, it is much cheaper in foreign countries than it is in India. Why this discrimination though? Wait, wait before you start blaming Apple for their soaring prices in India and charge them with racism, you better know who the real culprit is here. Yes, it’s not Apple who’s solely responsible for controlling prices in India. Guess who is then? VOILA! It’s our government. They’re the ones who impose heavy taxes on our not-so-poor-little iPhone, making it almost unaffordable for most of us. 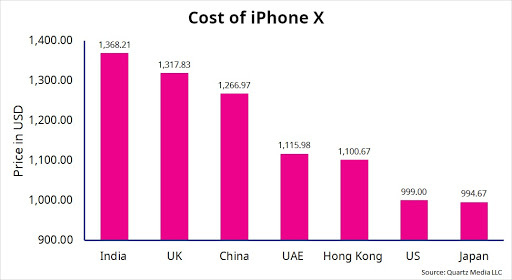 You know iPhone is almost 40 percent more expensive in India than in US and Japan. All thanks to our governments that impose multiple taxes on Apple on their imports. They have 20 percent customs duty, additional cesses and as if they were not enough, we even have to pay an extra 12 percent GST. Another reason for the ever-increasing price of iPhone in India is the constant depreciation of the Indian currency, mostly led by misguided economic policies of the central government. Now, the only question that remains is why does the government impose these taxes? Is it because they simply don’t want us to buy an iPhone? Well, maybe yes. Because see, if you buy an iPhone who will buy the local phones? This game of the government is called ‘protectionism’. What is protectionism? It is what the government does to protect the local businesses from foreign competition. They often do it by imposing import taxes so that foreign goods become expensive, by allowing imports of only a fix quota of goods or by imposing customs duties. The government claims that these policies ‘save’ and ‘create’ domestic jobs by eliminating competition from cheap foreign goods for Indian companies. However, these policies often protect their vote banks at the cost of everyone else. Okay, so we’re not saying that iPhone is cheaper than your Vivo but which one you should buy must not be the government’s call. Their job should be to allow all traders to offer their goods and services and let the consumers decide what they want to consume. Instead of regulating imports of foreign goods, we should be free to trade with the rest of the world. This will not just increase competition, leading to lower prices but will also enable consumers to have access to thousands of choices and latest technologies developed in foreign countries. Now if you’re thinking that at least the government’s intentions are good because they’re trying to save our local jobs then hold it. That’s not their intention. They’re not trying to save jobs but are creating ‘vote banks’ for themselves. Because nobody exactly loses their job here. While earlier they had 1-2 companies to work at, now in a free market they’ll have tens of new companies offering thousands of new opportunities. That’s the magic of the free market. Moreover, with all the money consumers save by getting cheaper goods, there would be more investments in the economy, leading to the creation of more jobs. Now back to your iPhone. You see, it could have been much cheaper, and you wouldn’t have had to order it from abroad, only if our government cared for us, our choices and the economy and didn’t impose all those taxes to ‘protect’ us. So next time you check an iPhone’s price in India, you know who to blame.